After a few bowls away from Baba, I decided I needed to redevote myself more fully to my quest. The last major ramen shop before the Babakuchi intersection of Waseda-dori and Meiji-dori was Shichifukujin (Seven Gods of Good Fortune); there are a few kind of crappy looking cheap places closer to the university, but I decided to save those for the end. Shichifukujin seems to be a fairly well-known store, at least judging by the number of magazine articles posted outside by the door. I think it's a branch store, and the original master seems to be a jolly, hefty fellow who himself quite resembles one of the titular Gods of Good Fortune. The vibe was old-school ramen place fixed up a bit - old-school and no frills, but not dirty or down at the heels at all - there was even a waitress taking orders, rather than customers calling out directly to the chef. It was nearly packed, with a surprising amount of young single women as well as men. If the atmosphere was fixed up old-school, so were the noodles. Shichifukujin serves up a style of ramen rarely seen these days in the trendy ramen scene, namely straight up old fashioned Tokyo-style shôyû. Shichifukujin's ramen is basically a slighlty modified version of the almost stereotypical image of ramen that appears in manga, anime, TV shows, and other cultural products all over the world - the classic no frills shôyû ramen found in yatai stalls and local cafeterias all over Japan. 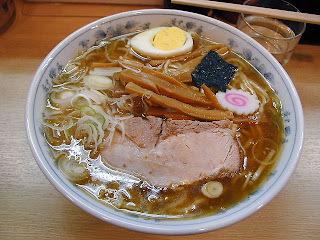 Thin dark brown shôyû-based soup, medium thickness noodles, onions, menma, and most crucially for the sake of image, the pink and white swirly sliver of fishcake known as naruto. 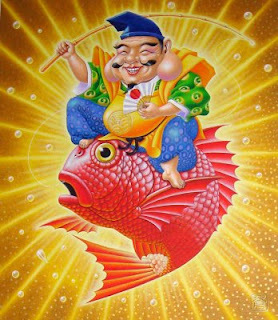 Being more of a Kyushu / tonkotsu guy, I always took the presence of a naruto as a kiss of death, a sure-fire sign of crappy ramen. However, I had only ever eaten said bowls at places that were not ramen specialty shops, merely shops that served ramen. Thus, Shichifukujin would be my first experience of this style of ramen done right. The tsukemen seemed extremely popular, and I was almost the only one who ordered ramen rather than the dipping noodles. Shichifukujin did not disappoint. I don't think shôyû will be displacing tonkotsu at the top of my hierarchy, but this was a very tasty bowl of ramen. I liked the thickness of the noodles and there were a lot of them - it took me so long to eat my way to the bottom of the bowl that I started to wonder if the cook had slipped me some extra noodles to make up for my lack of roast pork. I left Shichifukujin full, satisfied, and with a new respect for the humble old-school Tokyo-style shôyû.